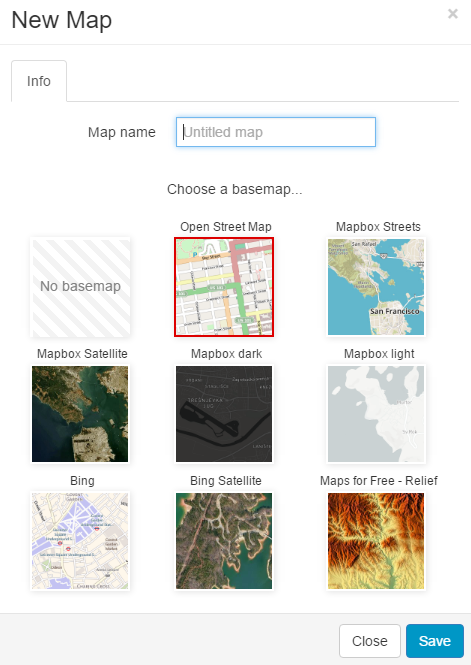 Note: Mapbox basemaps are available only for Premium users. Contact us for more info about available plans. Additional information about the map can be accessed and edited in Map Properties. 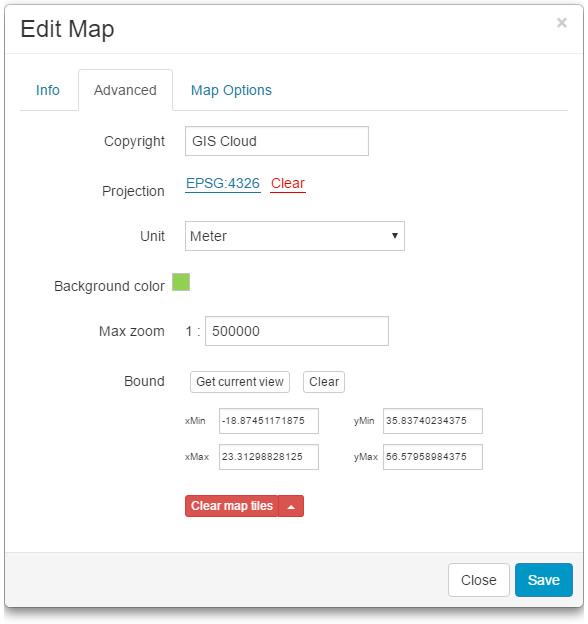 Map Copyright – Allows for text to appear in the lower right corner of the map. Visits – Shows the number of visits to the map. Created – the date when the map was created. 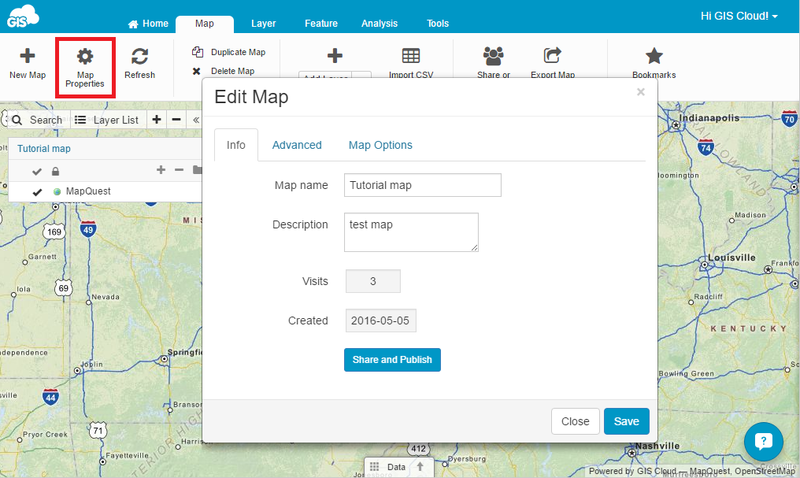 Share or Publish – Share or Publish your map. Projection – Select or change a projection from the list. Note that for maps with basemaps it is not possible to a change a projection. Map units – Select from Meter, Degree, Foot or Foot_us. Background color – Defines background of the Map View. Map bound – saves coordinates of your current view or manually imputed coordinates. Every time you refresh your map or click on View entire map you get the view extent of a map you bounded to. Clear map tiles – if you experience any problems with the map display, you can clear layer tiles or reinitialize the map. In this tab it is possible to set custom map options like the custom search. Custom search returns results only from the specified attribute columns. The full list of available map options can be found here. Saves current view extent you are working on and makes a shortcut to it. You can name a bookmark to help you identify a particular spatial extent of a map easier. You can access Bookmarks tab in Map toolbar. Access Map toolbar on the ribbon. Click on the Bookmarks tab at the end of the Map toolbar. Name your bookmark and press Enter. Bound is a feature, similar to Bookmarks, that saves coordinates of your current view or manually imputed coordinates. Every time you refresh your map or click on View entire map you get the view extent of a map you bounded to. Click on the Map properties tab. Edit map window will open.